Textually Active is an evening of provocation and speculation on 'art - text - space' that includes performances, readings, and interactive artefacts by Kim Charnley, Naomi Cristofoli, Sally Hall, Mark Leahy, Kayla Parker, Maddy Pethick, and Pylon Press. Textually Active is about providing a critical space for debate and performative practices in Plymouth and the South West of England. It is curated and run by Driftingspace, a collaborative art practice held between Jason Hirons and Sally Hall. As Yet Unseen slow speed and normal from Sundog Media on Vimeo. Photos: 16mm frame from filming by Jacqui Knight, me operating Tony Hill’s Elmo 16mm projector, hand-processed by James Holcombe during the CineStar artist’s 16mm film workshop run by of no.w.here at The Island Centre, St Ives,11 and 12 May 2013; pics of The Plymouth Athaneum taken during my visit on 22 May 2013, thanks to Wendy for showing me round. I want to thank Jason and Sally, aka Driftingspace, for inviting me to be part of this event. 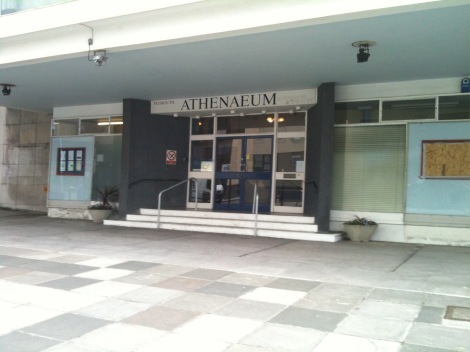 My only visit to the Athaneum before Textually Active was 20 years ago, to see a film with a friend Ann Hedley Hunt, who was a writer and a kind of mother figure to me, and who has since died. The film she invited me to see with her was Awakenings. (2) It’s a film directed by Penny Marshall, based on Dr Oliver Sack’s book (3) about people who’ve been in a vegetative state for 40 years, after they were infected in childhood by encephalitis lethargica – an extreme slowing down of the brain. (4) Max von Sydow, playing an eminent neurologist, refers to the patients as “children that just fell asleep”. However, the neurologist Dr Sayer, played by Robin Williams, believes that they are still alive inside, and the film is about his attempts to wake them up again. So, tonight I wanted to do something about cinema, memory, time, and childhood. 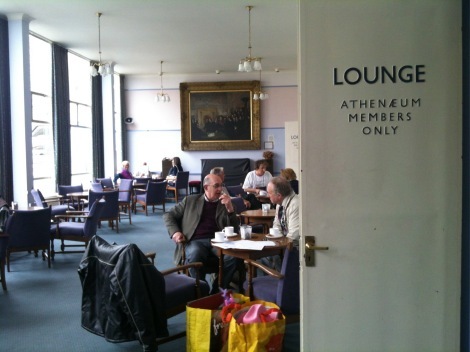 I was around three and a half to four years old before I can recall any memories of substance, which are my first experiences of cinema in the Abderdare Rex in South Wales, where my mother worked as an usherette. When Bid my maternal grandmother came to stay with us, she took me to see Snow White and the Seven Dwarfs. I remember sitting in the warm darkness of the cinema, the seat material prickling the backs of my legs, and the beam of my mother’s torch moving to and fro as she walked up and down the aisle. My grandmother, the seamstress - she was an expert at cutting cloth to a pattern and making clothes, my mum as an usherette, and now me as a film-maker and occasional projectionist… I wanted to show you a film I made nearly 20 years ago called As Yet Unseen that brings together these things. This is a photograph taken of me by my mum. In the photo I’m 7 months old. We’re staying with Bid and Jack, my mother’s parents, at their council house in Middlesbrough. We’ve just come back from the corner shop, where my mum’s bought some Vim (5) - for you youngers, that’s a scouring powder used for cleaning sinks and stoves, kitchen tiles and utensils. In the original photo the container of Vim is in the pram with me. I’m bundled up in a home-knitted wooly hat, scarf and cardigan because we’re up in north Yorkshire, it’s January, and it’s cold. According to my mum, I still have the dark red hair I was born with, as I didn’t go blonde until I was 10 months. My mother says this is the first time I looked directly into the camera when she took a photo of me. And when I, as I am now, look at this image, it is like I’m looking into a mirror. Our eyes meet. I feel connected, as if my baby self is looking directly at me across time. It’s one of a selection of family photos I used to make the film, which evolved from the combined dreams and memories of my mother and myself. It’s a personal view of the daughter-mother relationship, set in a room poised on the threshold of birth or death. The room is at first blank, colourless; we enter through the window like an intruder or ghost. The room becomes literally a ‘living room’ as elements within it come to life, and memories of early childhood are activated and set in motion. The film itself originated on 16mm colour negative film, and my frame-by-frame animation was shot by Stuart Moore with a Beaulieu camera in a life-size stage set, constructed in the L-shaped studio upstairs in the Batter Street annexe at Plymouth Arts Centre. The set was designed by me and made by my brother, Miles, who was an art student at University of the West of England at the time and did this as a work placement for his BA course, Art in Social Context. The stop-frame animation filming took place over period of a couple of weeks. The exposed rolls of film were sent off to London on the train to be processed at Filmatic laboratory, and a positive print made from each roll was sent back to Plymouth. At the end of the last century, one of the screening prints was telecine-ed (7) and transferred to BetaSP video, and this was digitized in the twenty first century to make a digital video file. So, the film has gone through several transformations and journeys to be here at the Athaneum. Digital technology allows me to present the film this evening with the images and the sound slowed down, but its material origins are still evident in the softness and grain of the image, and the flecks of dirt and minute scratches on the emulsion surface. Now, my infancy and very early childhood is an unknown place to me. In an attempt to recover some residue of memory, I looked through family photographs and quizzed my mother for her stories that the images prompted. Also, I asked her to keep a dream diary. She kept a small, spiralbound notebook under her pillow, and when she woke, she scribbled down notes of what she had been dreaming. At the time, she was teaching English as a Foreign Language (TEFL) in Cambridge. A decade or so earlier, she’d moved from the wilds of British Columbia, where she worked as a nurse, when Bid, her mother, got Alzheimer’s. (10) My mum arranged for my grandmother to be looked after in a small care home run by a Polish couple, and Bid was content listening to Polish broadcasts on the radio, despite only ever speaking English. She had forgotten how to speak, could not follow the rhythm and flow of conversation, and only gave one word answers to questions. Sitting in bed, she smiled when I stroked her hand, her thoughts drained out when she wasn’t looking, slipped away when we weren’t listening. Her mind was elsewhere, lost in silence. When I was making As Yet Unseen, I asked my mum if she could remember any of Bid’s dreams. My grandmother had dreamt as a child of a cinema and film projections within a fireplace, and she experienced this dream repeatedly during her life. From this, the idea of the hearth, the fireplace, as a maternal place for dreaming and memory became the centre of the film, around which the ‘action’ took place. The decorative tiles that animate around the fireplace and the wallpaper painting are based on the patterns on my mother's dresses when I was a small child. The sequences of 35mm slides back-projected onto the fireplace itself originate from our old family snapshots. 2. The 1990 film featured Robert De Niro as Leonard Lowe, a post-encephalitis patient whose catatonic trance state is relieved by the drug L-dopa. Lowe, who is cared for by his mother, awakes, but has no memory of the intervening 30 years that he has ‘lost’. 8. When making films, it’s customary practice to include an audio ‘pip’ on the soundtrack that synchs with the visual number 3 frame on the countdown leader. For As Yet Unseen, Paul and I chose the sound of a baby’s little fart from a recording made while it was breastfeeding. The same baby’s snuffly suckling sound begins the film.